The last couple of Knicks games have been, well, rather Knicksy. Their defense has been lacking and badly, allowing 114.6 per 100 possessions according to NBA.com. Recently, though, New York’s scoring efficiency (104.7 points/100 possessions) has actually been higher than their average rate of 103.9 in their other 54 games, and how they distributed their shots across the floor is more than worth discussing by itself. By design, New York takes a lot of shots from the perimeter, most notably when Carmelo Anthony is playing power forward. That’s usually fine since that happened for most of 2013 and their offense finished third in scoring efficiency. This season’s starting lineups have been different for a lot of reasons, but during the last two games their lineup had a makeup similar to 2013: Anthony at power forward with Tyson Chandler, two point guards, and a small forward to space the floor that’s currently J.R. Smith, though Iman Shumpert would likely start in his place if he were healthy. The love for the jump shot is probably more noticeable against Orlando when the Knicks attempted 73 field goals outside the paint, according to NBA.com, which is the second-highest total by any team this season and surpassed only by their incredibly Knicksy game at Milwaukee on December 18. The percentage of shots they took outside the paint against Orlando, however, was the highest by any team at 76.84 percent, well above their league-leading average of 61. As for their outing against Atlanta, it was the 15th-highest percentage by any team at 70.79. 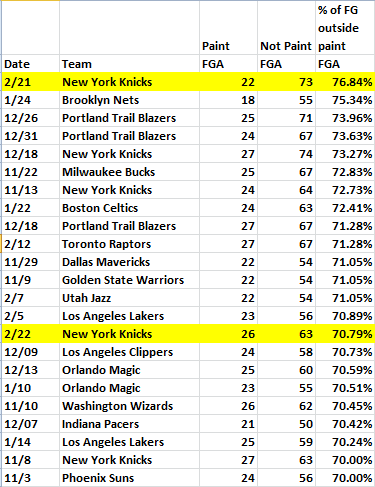 The Knicks are responsible for five of those 23 games and are the only team to pull them off in consecutive ones. Anthony, Smith, Tim Hardaway Jr., and Raymond Felton combined for 109 of those 136 shots outside the paint, though they’re not totally bad attempts. Obviously, three-pointers are worth more than 20-foot twos and the Knicks took seven more threes on average than they normally would, but they also took 11 more mid-range shots per game. 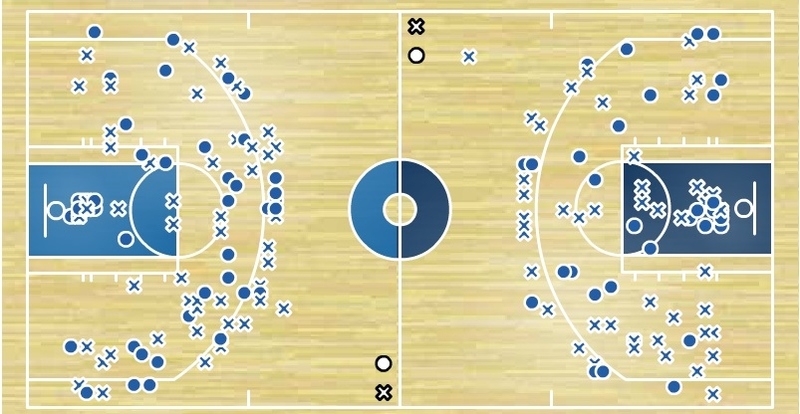 The shots that vanished were from around the rim, taking eight less attempts per game against Atlanta and Orlando. Even Chandler, who supplied a good chunk of the attempts around the rim thanks to alley-oops, got in on the fun from the dead zone of the floor but had little success. The same accuracy from the arc is nice to see, though Anthony hit some insane, heavily contested attempts during that stretch which helps explain the lower assist percentage. The mid-range accuracy is also steady but Amar’e Stoudemire and Anthony, for example, had upticks from there while combining for six less shots around the rim per game. For Anthony, some of that’s obvious when looking at his scoring outbursts from those games. He’d have isolations against a defender like Tobias Harris, someone he could probably take off the dribble whenever he wanted, but pulled up from either the arc or mid-range with (to his credit) decent success. Overall, the Knicks’ shot distribution was out of whack when factoring in how many shots were taken in high-efficiency spots (around the rim and the arc) versus low-efficiency ones (non-restricted area spots in the paint and mid-range). New York took about the same number of shots from each with a 49-46 high-low efficiency distribution versus Orlando and 45-44 against Atlanta. That’s not exactly great when teams on average take about 57.5 percent of their shots either around the rim or from the three-point line, and each of those games placed among the bottom 25 percent of all outings this season in terms of what percentage of a team’s shots were taken from high-efficiency spots of the floor. For the season, New York has been slightly above average with their distribution between high-efficiency shots and low ones, currently at 58.1 percent. Part of that isn’t surprising when they take the sixth-most threes per game, but they also take more shots from mid-range than they do at the rim, something the Blazers, Pacers, Wizards, Cavaliers, Magic, and Celtics do. Last year, 66.1 percent of their shots were from around the rim or three. That would’ve ranked 2nd this year. Is this all something to panic over? The Knicks are in a state of panic as is. As constructed, though, they’re a team that relies on scoring with range with or without some their players currently injured. Once in a while there will be nights like the last two where they’ll fall head over heels in love with the jump shot, and along with their inconsistent defense it will cost them games. To be an optimist, though, there’s also the potential for their shooting to catch fire and get them back in the playoff hunt. Heck, it might open up more looks at the rim. Whether New York lives or dies by the jump shot, it’s been remarkable watching just how much they can attach to it. They’ll host Dallas tonight, a team in the middle of the pack in allowing both shots around the rim and threes, according to NBA.com. Whether the Knicks continue to look allergic to the paint is something to look for along with the chance Vince Carter scores a season-high at the Garden.